Marlin magazine, Power and Motoryacht magazine and the P&MY e-newsletter Rhumbline have all done some great articles recently featuring Paul, our company and the type of boats we build. We’ve also received fine coverage by Dean Travis Clarke of the recently-launched 67-foot Paul Mann custom Lisa K, a remarkable and technically advanced boat. We hope you’ll take the time to read these interesting articles. 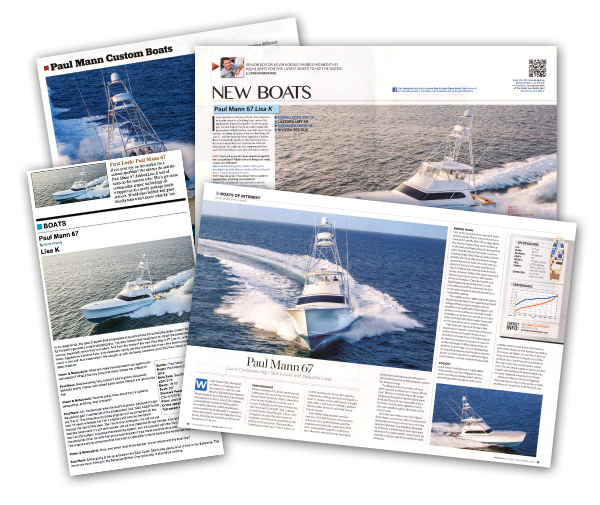 Click here to download a PDF version of the Marlin magazine article about Paul Mann Custom Boats. Click here to download a PDF version of the Power and Motoryacht magazine article. Click here to download a PDF version of the Rhumbline article. Click here to download a PDF version of Dean Travis Clarke’s Marlin magazine article.